"For Philip found you vagabonds and helpless, most of you clothed with sheepskins, pasturing a few sheep on the mountain sides, and fighting for these, with ill success, against Illyrians and Triballians, and the Thracians on your borders; Philip gave you cloaks to wear, in place of sheepskins, brought you down from the hills to the plains, made you doughty opponents of your neighbouring enemies, so that you trusted now not so much to the natural strength of your villages as to your own courage. Nay, he made you dwellers of cities, and civilized you with good laws and customs". In Arrian (Anabasis of Alexander 7. 9, 2) (Heinemann E. Iliff Robson, B.D. Vol II, London 1949) Alexander is being presented describing the Macedonians in this lively, if a little exaggerated, way. 01. 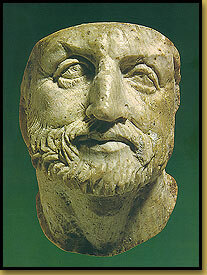 Ivory head thought to be Philip II from the large grave of the tomb of Vergina. It probably belonged to the decoration of his death bed.